Seattle graphic design firm, Design Hovie Studios, Inc., has designed the new ad campaign promoting Barnard Griffin's award winning Rose wine. 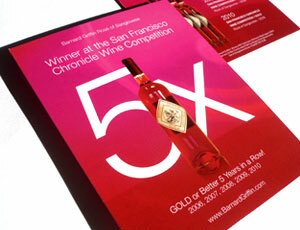 Barnard Griffin Rose has won gold or better 5 years in a row at the San Francisco Chronicle Wine Competition. The campaign expands on the look and feel of the widely popular Rose posters created by Design Hovie Studios over the past 3 years. The addition of a large 5x in the background alerts the viewer to the amazing run of awards for the wine. The entire project was a 1 month process designed in Seattle under the Creative Direction of Hovie Hawk and in association with Wines of Washington Promotion.